Jack Black Turbo Body Bar Scrubbing Soap, 6 oz. 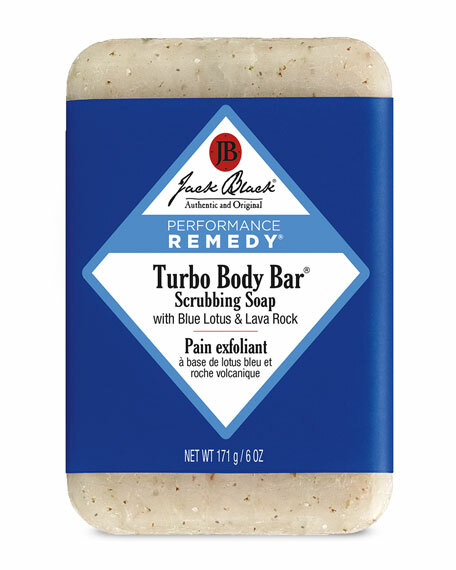 Jack BlackTurbo Body Bar Scrubbing Soap, 6 oz. This Jack Black energizing, deep-cleansing bar scrubs away dirt and exfoliates the body for clean, smooth, healthy skin. This deep cleansing body soap, made with Jojoba Seed Powder, Pumice and Pracaxi Oil, buffs away dead skin cells and dirt while invigorating skin. Infused with a woodsy blend of aromatic Cedarwood, Sandalwood and Eucalyptus, our rich lathering formula leaves skin smooth, soft and energized throughout the day.